The Femedic delivered two workshops to medical students at the Students for Global Sexual Health conference in December 2018. 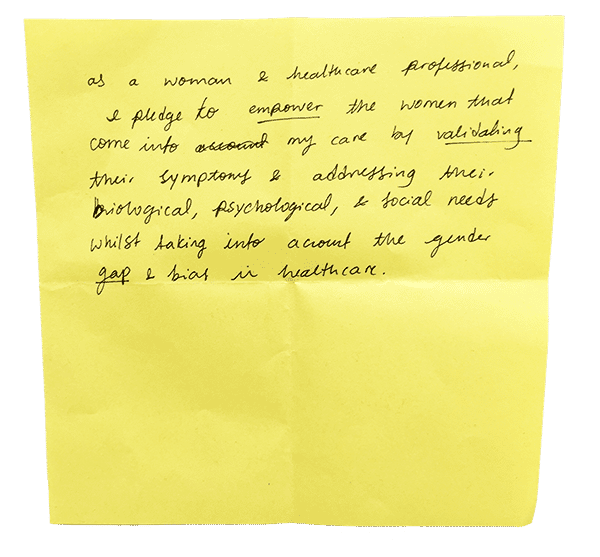 Together, we examined how gender bias in healthcare impacts health outcomes and the students created a pledge that outlines how they plan to remedy this inequality in their future practice. This is their pledge. 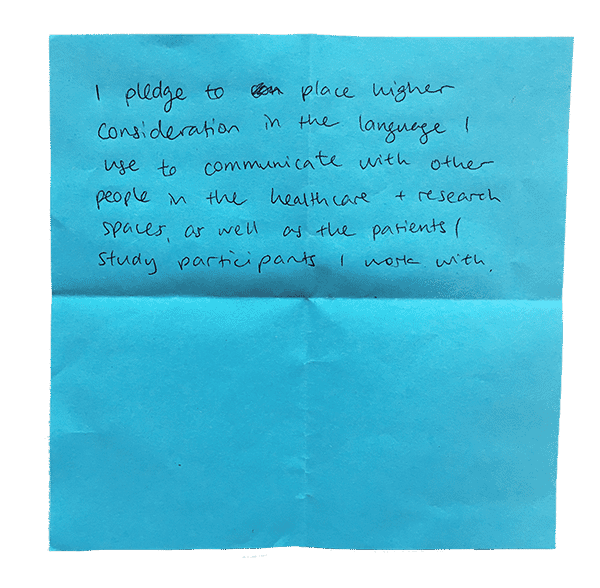 We, Students for Global Sexual Health, pledge our commitment to address, and redress, gender bias in healthcare, through our practice, communication, and the way we work with our fellow medics. We pledge to listen to women and to be more aware of the ways in which sexism and gender bias can impact their experiences. We will educate people around us and question superiors and colleagues when we suspect they are allowing gender bias to impact the care they deliver. In doing this, we recognise the need for non-confrontational and constructive communication. In listening to our female patients, we will never wash over the details of a condition or test we are doing when talking to them. We will instead empower patients about their own symptoms and not assume our judgement of their requirements is right. Our clinical reasoning will be clear and we will make sure our patients have no outstanding questions or uncertainties. This is essential in ensuring a good relationship between doctor and patient. Language is important, and we will place higher consideration in the language we use to communicate with other people in healthcare & research spaces, as well as any patients and study participants we am working with. We are aware that the historical, sexist connotations of ‘hysteria’ are still present in assumptions about women, stress, and mental health, and will bear particular mind to how we discuss these topics with women. When patients come into our care, we will address their biological, psychological, and social needs with mind to how gender inequality impacts their experiences. Their gender, culture, race, sexuality, or ability have framed their views and experiences and this could impact how they view medical plans, or why they have sought care in the first place. We will never assume someone’s gender identity or sexual orientation in a healthcare setting. We pledge to improve access to healthcare for trans people. While we will not diminish the hormonal impact of being a woman, we will also not put medical problems experienced by women down to this. We will ensure that all people who have periods are aware that just because periods, and period pain, are common, this doesn’t mean that they shouldn’t be treated as issues or with appropriate concern. We are aware of the ‘gender pain gap’ and pledge to take this seriously in our practice. We pledge to continue our education in emerging illnesses and the impacts of gender bias on our patients. We will not only educate ourselves but work to educate other people about female reproductive issues.